The market situation for Belgian consumer durables retailers has deteriorated in most segments. Competition is fierce and brick-and-mortar stores are suffering from lower footfall. Consumers are seeking additional shopping experiences and services rather than simply purchasing products. Online retail is increasing sharply, with a notable emergence of big global players such as Amazon and Alibaba. Consumers now have easy access to the latest trends, new products and price comparisons. In 2018, household appliances retail recorded modest sales growth, but average sales prices in this segment decreased. In the furniture and textiles/footwear subsectors small retailers suffer from the overwhelming market power of large players, which are able to offer a highly diversified product range at lower prices. The consumer electronics market is mature and sales are decreasing (both units and value), with persistent growth only seen in innovative sub-segments (e.g. drones). Strong competition and an increase in e-commerce are putting downward pressure on prices and upward pressure on service. Retailers have to cut their margins to retain customers and keep market share. Any increase in purchase/input prices is difficult to pass on to consumers. Therefore, profit margins are expected to deteriorate again in 2019. Payments of retailers to suppliers generally take 30-60 days. The number of non-payment notifications has increased sharply in H2 of 2018, mainly caused by smaller retailers, while the payment behaviour of larger retailers is still satisfactory. Both payment delays and insolvencies are expected to increase in the coming six months, mainly affecting smaller businesses. This is bucking the overall trend of Belgian business insolvencies, which are forecast to level off in 2019. Due to the more difficult market situation we have downgraded the business performance/credit risk situation of consumer durables from “Fair” to “Poor”. 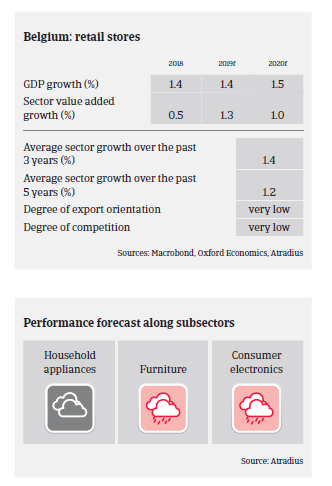 Our underwriting stance for larger consumer durables retailers with higher margins and for businesses with good financial performance is generally open. However, over the past 12 months we have increasingly tightened our underwriting stance for smaller retailers across all subsectors to restrictive, due to the increased number of payment delays and higher insolvency risk in this business category. After nearly a decade of annual improvements, 2019 is expected to mark the first year of insolvency growth since the crisis.